Just because it’s January does not mean it’s too early to think about gardening. We've been talking a lot lately about what you can do in the winter to get for spring. 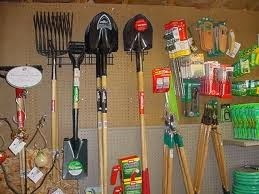 One of the things you can do is make sure you have the essential gardening tools. There are some things you should always have in your garage or shed. They’ll come in handy once spring rolls around and you are ready to get out and garden. Every good gardener should at least have a watering can, fork, hand fork, spade, rake and a trowel. If you've these items you’re off to a decent start with your gardening. Make sure you have a good set of gardening gloves. Your hands will thank you. Gardening can expose your hands to thorns, twigs and insects that could cause damage. Make sure you have gloves that offer cut and abrasion resistance. Fit is also important. Remember, you want to protect your hands but you also need to have mobility and a good grip to complete your gardening job. Consider buying a full-sized shovel. If you have to do any serious digging, a sturdy shovel will help ease strain on your back. Shovels are best when you need to dig holes and trenches. They are also helpful if you need to move large amounts of soil. You may also want to get some tools that can help with pruning and cutting. Determining what you plan to cut and prune will determine the best tools. Lightweight clippers are great for cutting flowers. Heavier clippers are better for pruning stems. If you think you will be cutting down any larger branches, consider investing in a pruning saw. The curved blade of the pruning saw makes for easier cutting and fits into awkward spaces. We know the advantages of a lawn sprinkler system. For a smaller garden that needs less water, you should consider a watering can to sprinkle water on delicate seedlings or newly planted plants. If you need to remove weeds, a hoe is a great tool. The hoe allows you to push along the surface of the soil to slice through the neck of the weeds, where the stems meet the soil. As we grow closer to spring, check out your local lawn and garden stores for spring sales on the items above.